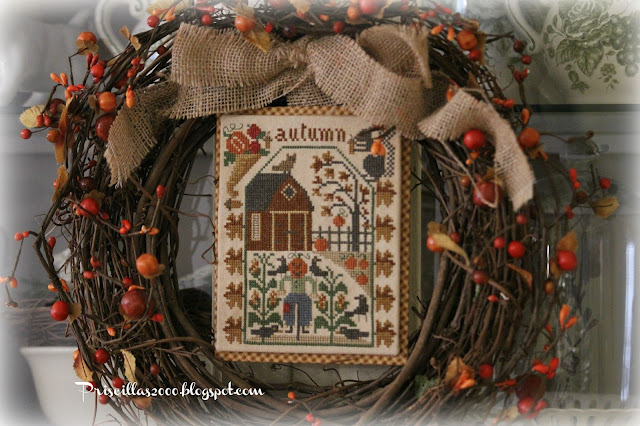 I finished stitching this Prairie Schooler Autumn from the Prairie Seasons leaflet and today finished it into the seasonal wreath. This is the third season I have stitched .. only Winter is left to do ! I just wrapped a wired berry garland around the wreath and used a burlap strip tied in a bow to attach to the wreath . 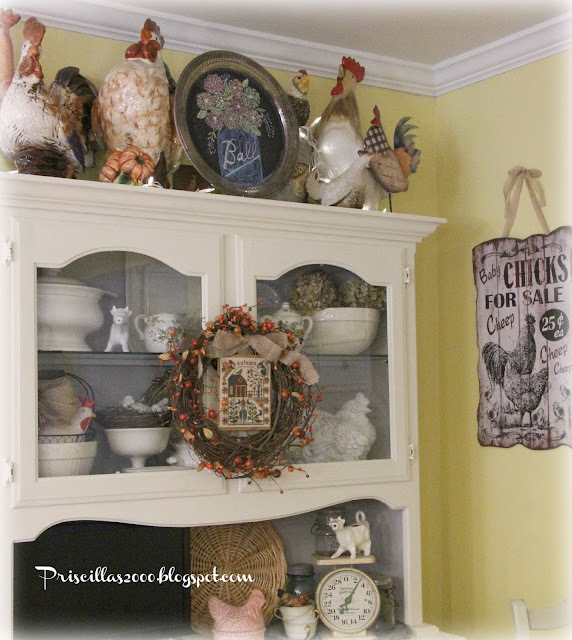 It hangs on the doors to my chalk painted hutch in the kitchen..I just love it! 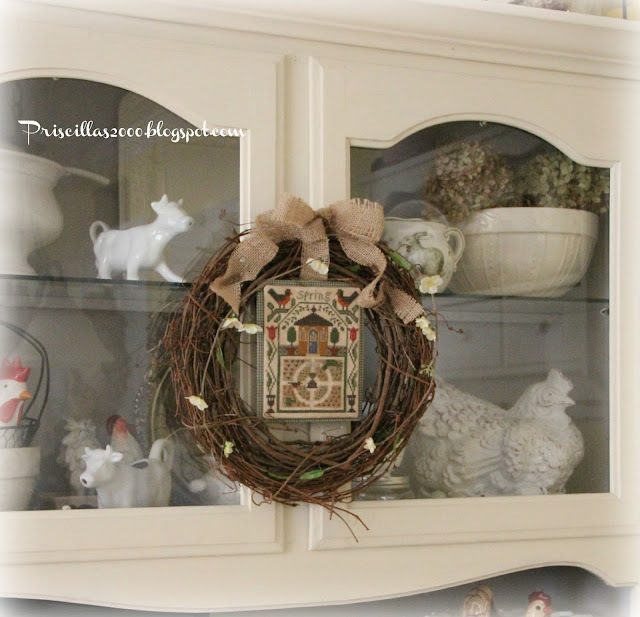 I got the wreath at Hobby Lobby and I keep using the same wreath and just change out the design.. I used some light brown gingham check on the bias for the background mat..The stitching and the mat are both on needlework sticky board. 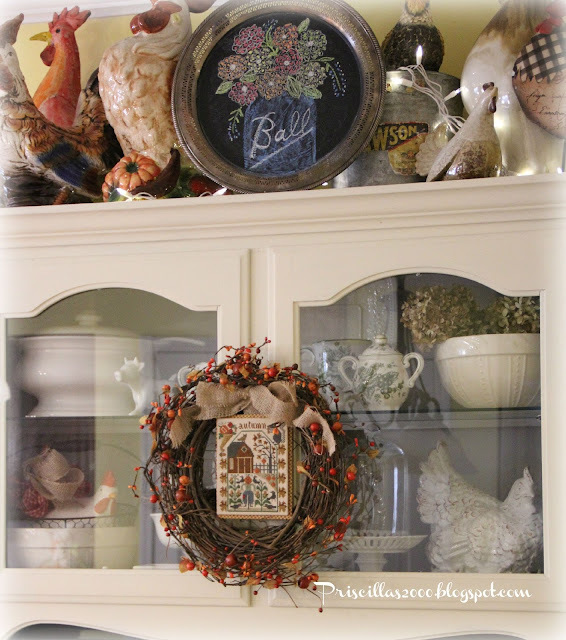 and the first one I did was Spring..
Next week I am going to start my Fall decorating and I cannot wait! So do you love it ???? Oh, I do love it! Fabulous finish! Fall is my favorite season, too. I love the colors you used. You should join the Prairie Schooler SAL hosted by Kaye of Kitten Stitching. Love Love Love!! I may use your idea to mount some of my smaller pieces on sticky board and use them on wreaths etc. Will you do a tutorial showing us stitchers how to do this with no wrinkles and getting it straight? I know I would find it helpful. I just picked up a piece from my framer today. It is a Thanksgiving piece and I love it. Like you, I am ready to decorate for fall. I am thinking September the 1st might be the day!! I love it. 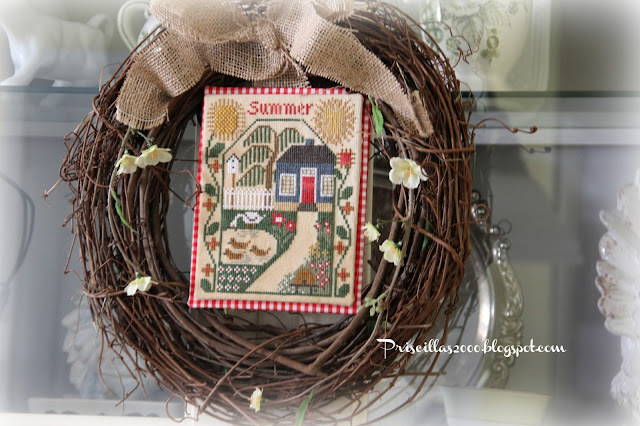 I have been so inspired by your stitching that I just ordered the monthly cottages. I second Arlene's idea about the tutorial. You are so talented. We want to see the details!!! Love it! But then, what's not to love about a Prairie Schooler design? Hi Priscilla! Oh, it's adorable! You're so good and fast! Love your stitchery on your wreath on your hutch! :) Can't wait to see your Fall! I love them all but I think this is my favorite!! I really love the way you've finished this PS series! I'll have to remember that when I stitch future seasonal charts. I do love the Autumn one so much--great colors and who can resist that odd squirrel and pumpkin head scarecrow?! 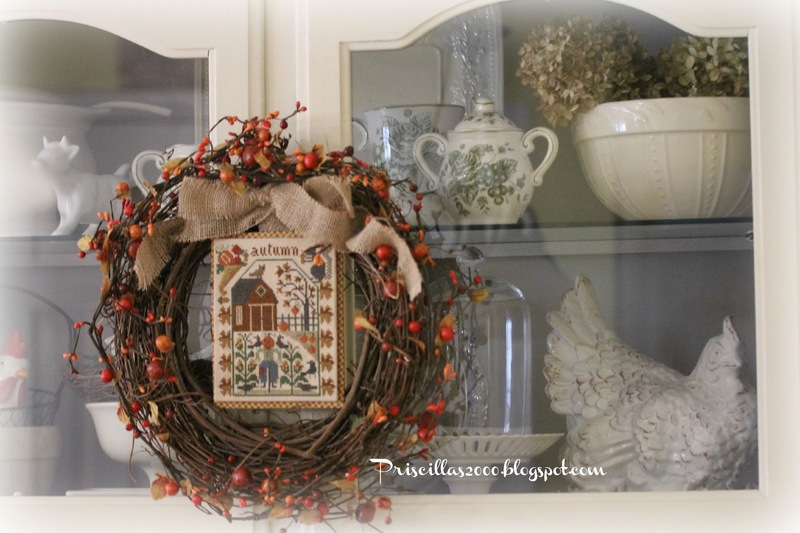 I love the idea of attaching that beautiful stitching on the wreath. I have been trying to figure out how to finish one of my personal designs. This might be just right. 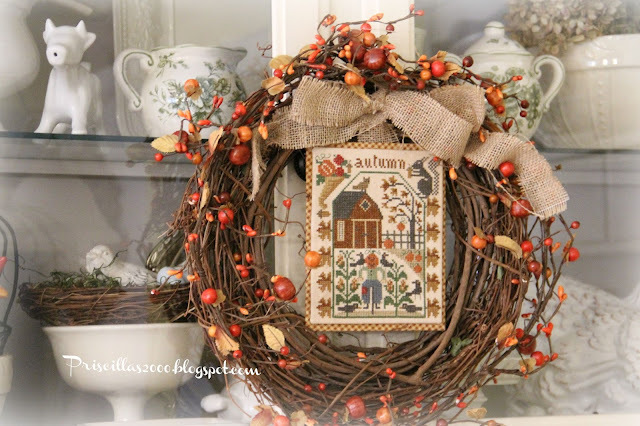 What a great idea for a wreath. I like the PS series too and have stitched a few. I really like these seasonal ones. Thanks for sharing. 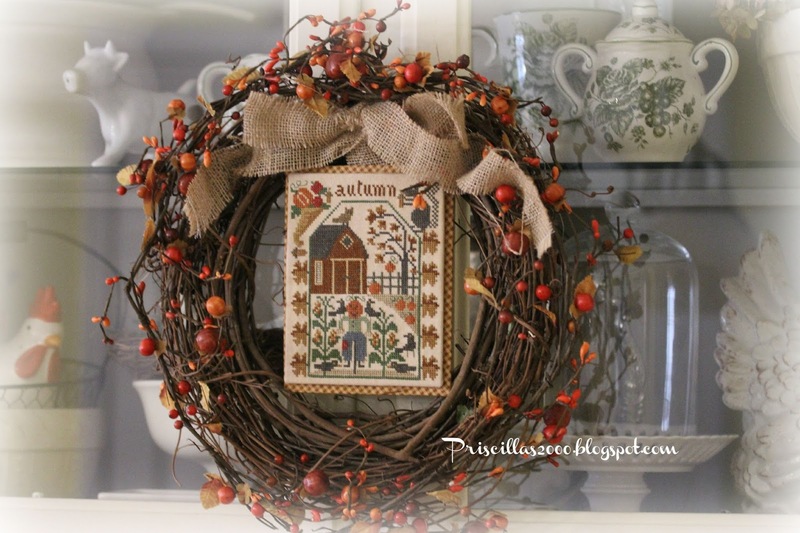 I just love your idea for a seasonal wreath!! And the Fall one is just wonderful. What a lovely cross-stitch. It looks great framed by the wreath. As always, I love that in addition to sharing your work with us, you also show us how you display them in your home. Thanks for much for linking up to last week's Stitchery Link Party.